this blog contains Michael's numbers and additional pertinent information from the month of May. if you want season stats and details about his overall numbers so far in 2017, that separate post is linked at the bottom of this one. and don't forget: if you haven't done so yet, please vote for Michael and your other favorite Cleveland Indians to go to the 2017 All Star Game this July 11. click here for all the voting rules and tips on how to ensure that your ballots are being submitted correctly. now let's get into Michael's May! one of his best overall outputs. to be frank, his performance in certain situations was downright disappointing. for much of May, particularly the first couple weeks, i couldn't shake the feeling that something was wrong with him, and that was without factoring his minor ankle sprain into the equation. Michael was painfully unreliable when coming to bat with runners in scoring position--a usual strength for Dr. Smooth--which accounts for his low RBI total. not to mention how after he registered a career high five homers last month, he didn't hit any balls out of the park in May. the majority of his hits were ground ball singles. to me, it appeared as though a few aspects of Michael's game were just "off" this month. if Michael wasn't still on the comeback trail after missing virtually all of 2016 with right shoulder and biceps problems, i would be postulating that he was battling with an ailment that nobody publicized. in the past, when Michael has struggled or gone through slumps, it was typically because he was playing hurt. is that the case now? not likely. if anything was seriously amiss, Michael knows enough to immediately report it to the trainers and doctors and they would not allow Terry Francona to continue running him out there. this season could simply be an exception to the rule due to him making a return after not having played regularly since 2015. that said, after a month of April that was both promising and productive, Michael's May kinda falls short in comparison. so let's start talking numbers. thanks to a 2-for-14 effort in his first four games in May, Michael's season batting average dipped down to .283. he hadn't been batting in the .280 range since April 20, when he finished the afternoon at .286. as a result of this, i couldn't help but wonder if all the steady playing time was tiring him out a bit and affecting his hitting. i thought the game might possibly be speeding up on him and that he perhaps was still readjusting to the league and its pitchers. whatever the issue, it didn't linger and he soon got back to hitting on a more consistent basis (albeit mostly when the bases were empty). separating the month into two halves shows an unmistakable boost in Michael's play. in his first 12 games between May 1-17, he bat .250 (11-for-44) with two doubles and just one RBI. conversely, in his last 12 games from May 19-31, he bat .333 (16-for-48) with three doubles, four RBI, three stolen bases, and two outfield assists. overall, Michael had a May batting average of .293. on the season, Michael's 2017 batting average currently stands at .300, eight points lower than where it was at the end of April. Michael also notably acquired a 14-game hitting streak this month--although he only obtained one hit in the bulk of those games--which originated on May 15. actually, his 30th birthday seemed to mark the beginning of improvement at the plate for Dr. Smooth. at the same time, he remained quite challenged in other regards. for example, Michael couldn't buy himself a hit with runners in scoring position this month, as he stranded every runner who was on 2nd and/or 3rd base in his first 17 at bats. (i go into all the specifics of his skid in the Areas Of Concern section of the blog down below.) so you can see how his month exhibited bipolar-like qualities; he excelled in a variety of areas, but labored in others. now let me break May down by the series. this month, the Indians found themselves on the road for a 10-day, three-city trip right out of the gate. they were set to play four games against the Detroit Tigers, three against the Kansas City Royals, and three against the Toronto Blue Jays. Michael played all three games in the rain-shortened Detroit series, but was subpar at the plate, going 2-for-10. once the team went on to KC, things didn't get any better. in fact, they got worse. to my surprise, he started all three games, but wasn't able to complete the third because he sprained his right ankle after trying to beat out a grounder. (more info on that can be found next in the Right Ankle Sprain section of the blog.) so he went a paltry 2-for-11. combine that with his Tigers game lines and he began May with just four hits in 21 at bats. Michael was essentially shut down and received treatment while the Indians finished their trip in Toronto, missing all three games in that series. i can't imagine he was too pleased to be sitting out this "rematch" of the ALCS, especially since he couldn't play last year because he was recovering from his biceps tenodesis (surgery). following a May 11 off day, the Tribe played a six-game homestand that commenced with three games versus the Minnesota Twins and culminated with three versus the Tampa Bay Rays. Michael's ankle was good to go and he played in every game. when facing the Twins, the Indians as a team did poorly in the first two contests, totaling an unimposing six hits, four of which were provided by Michael. sadly, while everyone else seemed to rediscover their ability to hit the baseball in the series finale, Dr. Smooth was held hitless. all-in-all though, he went 4-for-12 at the plate. then when the Rays came to town, he was in the starting lineup for all three games. i did not expect that because the Tribe had a 6 pm game followed by a nooner in Games 2 and 3 of the series and up until then, Michael hadn't started in consecutive games like that with such a short turnaround. i suspected (and disliked) that, on account of three other outfielders being injured, Michael may have been "forced" into playing even though he maybe shouldn't have been... at this time, i was still convinced something was wrong with him purely based on his offensive numbers, which were indeed offensive. regardless, Michael put together a 3-for-11 showing in the series with two doubles, two runs, and one RBI, which marked his first ribbie of the month. in total, he went 7-for-23 during the homestand. the Indians had an off day on May 18 before venturing on a brief excursion consisting of three games against the Houston Astros and two against the Cincinnati Reds. in Houston, Michael did well, going 4-for-12 with two doubles, two walks, and his first stolen base of the month. when in Cincinnati, he was 2-for-7 at the plate, including an RBI double, a run, and two walks. altogether, he compiled a 6-for-19 effort on the road. when the team returned home, they were scheduled to finish their home-and-home Cincy series with two games before playing three versus the Royals and three versus the Oakland Athletics. except, the second Battle of Ohio game got rained out and won't be made up until July. and so Michael opened the homestand 1-for-4. he had a lot of success in the Royals series, going 6-for-13, though all of his hits were mere singles. he also tallied two RBI and stole one base. lastly, when facing Oakland, Michael went 3-for-12 with three singles and one stolen base, as well as one outfield assist in back-to-back games. unfortunately, he could not muster a hit in the final contest against a very tough left-hander that he'd never seen before, and that put an end to his season- and team-high 14-game hitting streak. nevertheless, he concluded the last seven home games in May with 10 hits in 29 at bats. to sum up the month, Michael started out slow, injured his ankle, and then came back and went on a lengthy hitting streak. but as far as statistics go, a lot was left to be desired. he's having trouble hitting in the clutch, he's not driving in very many runners anymore, and he hasn't hit a home run since April 30. for all those reasons, this month will not be one of the most memorable in his career. but i do believe Michael will find a way to overcome these hurdles; he's too good a player for this to continue. would you classify Michael's May as good? the overall May batting average is around his norm. but if you base more importance on the zero home runs, five RBI, and his RISP shortcomings, then you might be underwhelmed with all the positive takeaways from Michael's month. leave me your thoughts in a comment below! in the game on May 7 against the Kansas City Royals, Michael was unexpectedly subbed out defensively for the bottom of the 4th inning. he had two at bats prior to this, going 0-for-2 and grounding out both times. before the top of the 6th inning, Paul Hoynes broke the news that he left the game with a sprained right ankle. after the game, Terry Francona provided an update on Michael in a video on the FOX Sports Ohio youtube channel. "it's not the dreaded high ankle sprain. he just, he hit 1st hard and hopefully it's a day or two. at least that's what they think now. i know tomorrow we'll know a heck of a lot more." on May 8, Jordan Bastian's blog on bastian.mlblogs.com revealed the latest news. "for the next day or so, he's going to get treatment," Tito divulged. "he's in that boot just to kind of take the weight off. the boot, i think, makes it look worse. he's not [far off]. does he play up here [in the Toronto series]? i don't know. if you see him play up here, you know he's doing well. i think the next couple days, just take the next couple days and let him get treatment on it and feel better." during the game against the Toronto Blue Jays, Tom Hamilton told radio listeners on WTAM 1100 that Michael said his ankle's not that bad, but he's in the boot to help speed up the healing process. then on May 9, Hammy conjectured during the Blue Jays game that Michael would likely be out until Friday [May 12]. Bastian's pregame blog, which was posted late, included more about Michael's upcoming schedule. via bastian.mlblogs.com, Francona informed, "we'll see tomorrow. i don't think he's going to play, but we might pinch-hit. we'll see. we'll see how he's doing. with the day off the next day, and him doing so well, i don't want him to play all nicked up." before the Blue Jays game on May 10, Tito indicated that Michael probably would not pinch hit. once again, Bastian's blog on bastian.mlblogs.com had the details from the manager's media session. "we'll see. i think he's probably angling for it. with the day off tomorrow, i doubt it. i wouldn't say never, but i doubt it." despite the day off on May 11, Michael came in to do some stuff, according to Bastian's May 12 pregame blog on bastian.mlblogs.com. 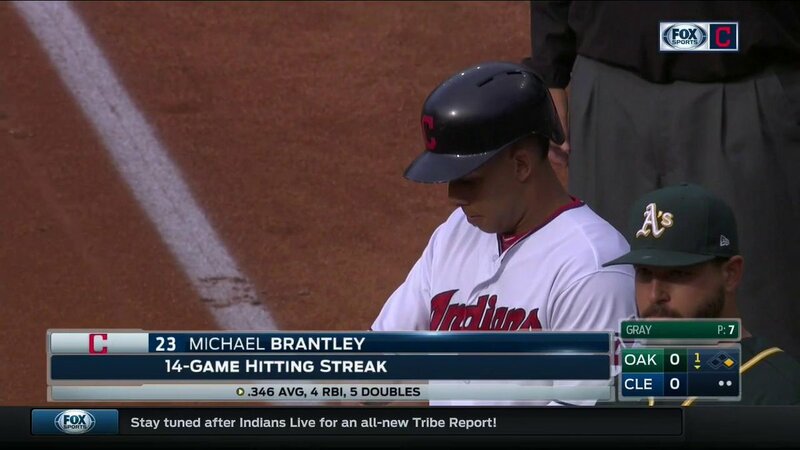 Francona declared, "Brant ran and he's good." and so Michael returned to game action on May 12 as was planned. "he's back, which is good," Tito shared in a twitter video from SportsTime Ohio. "he came out yesterday on the off day, did some running, did some moving around. he's ready to go." during STO announcer Matt Underwood's interview with the skipper, he also inquired if Michael would be limited in any way. "you know what? i'm sure he feels it. i don't think you go from, from not playing to feeling great, but he's perfectly fine to play. as long as we get his bat, he can manage the rest of it. he's good about that." Michael went on to play all of the final 18 games in May without any setbacks. i never panicked about his ankle. Michael used to have ankle sprains when he was in the minors and i remember he would tape his ankles when he was first coming up in the league as a precaution so that he wouldn't have as many problems. Michael's last injury of this sort came way back on August 19, 2010, when he suffered a left ankle sprain in a game against the Royals, no less. but he only missed four games and was in the Indians' starting lineup again on August 25. so i knew he wouldn't be out long now because he's dealt with this before and recovered quickly. Jason Kipnis-Francisco Lindor-Michael Brantley-Carlos Santana-Edwin Encarnacion-Jose Ramirez. that's a far cry from last month's top of the lineup. i knew something like this was coming sooner or later because Terry Francona did not like Kipnis batting in the 6th spot. and neither did Kipnis, which i think was more mental than anything else but... it is what it is. i'm just thrilled that none of the BOP moves affected Michael. once an opportunity presented itself for Francona to change the top of the order, he took it. twice. after Michael injured his ankle on May 7, the starting lineup for the Toronto series (May 8-10) featured Kipnis batting 3rd. when Michael was ready to play again on May 12, he was reinserted into and reclaimed his 3rd spot, much to my delight. but Kip did not return to the 6th spot, he got moved to 5th while Ramirez was dropped down to 6th. Tito apparently was unhappy with Kip and Lonnie Chisenhall batting back-to-back 6th & 7th, so he flip-flopped Kip and Hosey to rectify that situation. i, on the other hand, don't think it was a coincidence that this all happened around the same time that Kipnis began having better at bats and getting more hits. the Indians were not hitting collectively in the beginning of May. when the Tribe couldn't total more than six hits in the first two games of the Minnesota series, four of which were courtesy of Dr. Smooth, Francona altered the lineup even further. on May 14, with a lefty on the mound who was tougher on right-handed batters than lefties, Kipnis was leading off and Santana was batting 5th. the Mother's Day Top 6 looked like this: Kip, Lindor, Brant, Encarnacion, Santana, Ramirez. after a Tribe rout, Francona couldn't possibly change the order again, could he? oh yes, he could. for the game on May 15, he swapped Santana and Encarnacion so they were batting 4th and 5th, respectively. i wasn't too confident about Santana batting cleanup behind Michael because Santana has had well documented struggles in the cleanup spot before. but this move was made to potentially take some of the pressure off EE, who had yet to really get himself going at the plate. and so that remained the new top of the order for the rest of the month (minus one game when Lindor got a scheduled day off and Daniel Robertson bat 2nd in his place). when Michael played in May, he had a mix of Encarnacion and Santana batting cleanup directly behind him. Ramirez, Kip, Santana, and Encarnacion all bat in the 5th spot at one time or another. and the 6th spot was occupied by Kip, Chiz, Brandon Guyer (prior to his left wrist sprain and DL placement), and most recently now Ramirez. regrettably, it didn't seem to matter who followed Michael in the order because, even when he was hitting and getting himself on base, he wasn't crossing home plate very much. this month, Michael reached base a total of 41 times via hits, walks, fielder's choices, throwing errors, and fielding errors. he scored 9 runs total in May, meaning he was left stranded 32 times. it seemed like when Michael was on base, no one behind him could bring him home, but when he wouldn't get on base, then the guys behind him would hit. so we need to get everybody hitting in succession next month. what do you think about the current Indians Top 6? are there any modifications you'd like to see Tito make? let me know in the comments below! i have some very valid concerns this month. it's ironic that several writers recently posted articles about how Michael's back to the player he used to be and isn't showing any rust after being out for so long. i question whether these writers even looked into his May stats because there are some aspects of his game right now that are inadequate and unacceptable. Michael's performance in May when he came to bat with runners in scoring position was abysmal. in 13 games between May 2-24, Michael was 0-for-17 with RISP in 17 straight at bats and 20 plate appearances. he managed just three walks over that time period. and because of this continued skid, his season batting average with runners in scoring position plummeted from .318 to .179! that's a 139-point drop! i generally don't concern myself with the specific kinds of hits Michael gets, but it became a glaring issue when Michael hit nothing other than singles throughout the first half of the month. he didn't get an extra base hit until May 15, on his 30th birthday/his 10th game of the month. before then, his last extra base hit came on April 30 when he hit a 2-run homer. he totaled five extra base hits in May and they were all doubles. after hitting five home runs in April, he didn't hit any in May. what happened to the enhanced power i thought he'd developed from all the supplementary conditioning he underwent while recovering from surgery? left-handed pitchers turned out to be a headache for Michael this month, which is uncharacteristic for him. he went 0-for-8 in three games between May 14-21 when southpaws were on the mound. ordinarily, Michael can hit either type of pitcher, and by the end of the month, he did show improvement and started getting recurrent hits against lefties. i will be keeping a watchful eye on his ABs versus LHP in the upcoming months to see if he can maintain this upward trend. i also believe Michael did not perform to his standard capabilities while on the road in May. granted, he missed an entire series when he was recuperating from his mild ankle sprain. therefore, losing out on a potential 12 at bats or so may have negatively impacted his final stats in this category for the month. but going forward, i want him to do better than 10-for-40 away from home. what parts of Michael's game are you concerned with and want to see him work on? comment them below! almost every qualifying player on the team had a low batting average for the month of May. Michael did too for a while, but eventually he broke away from the pack. i'm excited to report that the player who had the highest May batting average out of all the qualifiers on the team was Michael with his .293 BA! the next closest average was .263, owned by Edwin Encarnacion. despite not having a lot of outstanding stats this month, Michael still had a couple team leads. in May, Michael led the team with a .293 batting average and .369 OBP, and he led the outfielders with 2 assists. he was tied for the team lead with 27 hits and 3 stolen bases. Michael also had the least amount of strikeouts among qualifying players with 10.
in addition, he was 3rd with 11 walks. Michael did not set any career highs for himself in May. Michael went his first 11 games of the month without an RBI. not ideal. in May, he totaled 5 RBI and left 36 men on base. that's a humongous discrepancy. as i already discussed, this was mainly a consequence of Michael's inability to hit with runners in scoring position. since Michael did not hit any home runs this month, i cannot do a HR:RBI ratio. hopefully i'll be able to include one in my June blog. Michael's K rate in May was 9.7% (10 K/103 PA). he struck out once every 10.3 plate appearances. this was a welcomed change from April and it's much more indicative of the type of contact hitter Michael really is. i was worried early on in May, however, because i noticed Michael was swinging at several balls low and outside the zone. he still does this occasionally, but as the month went on, he was taking swings at better pitches more consistently and getting the barrel to the ball more regularly. this month, Michael had a total of 26 groundouts, 18 flyouts, 6 lineouts, and 5 pop outs. he appears to be back to his ordinary self in regards to being a high contact hitter and getting most of his outs by way of making solid contact with the baseball, which is good to see. but i am a bit perturbed by the large number of ground ball outs in comparison to everything else. i'd like to see him hit more balls up in the air (and of course have them drop in for hits lol). Michael had a hit in 19 of the 24 games he played in May and reached base safely in 22 games. he had 5 hitless games, but still reached base in 3 of them. Michael had 7 multi-hit games, 1 three+ hit game, and no multi-RBI games. he had at least one RBI in 5 games. he did not have any go-ahead hits or go-ahead RBI this month. 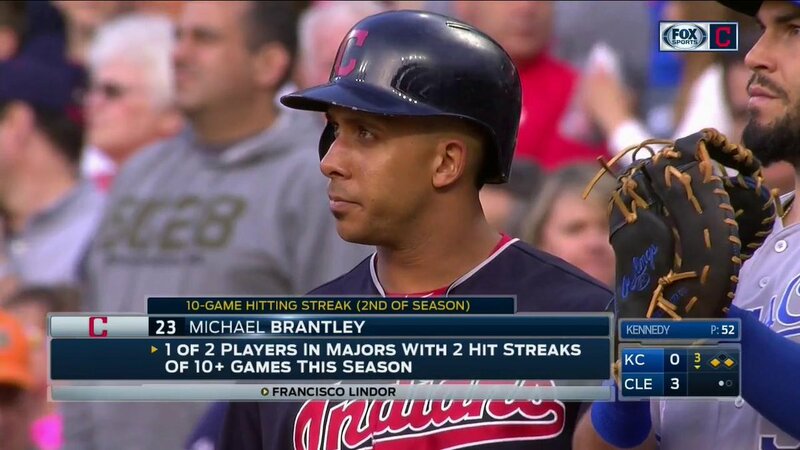 the Indians were 12-12 in games that Michael played in and 1-2 in the games he missed. Michael had a 10-game on-base streak on the road between April 7 - May 3. it spanned over April 7-8, April 17-22, and May 1-3.
in addition, Michael had a 14-game hitting streak that spanned between May 15-30. during this streak, he bat .345 (19-for-55) with 19 hits, 5 for extra bases, and 24 total bases. he had 14 singles, 5 doubles, 5 RBI, 7 runs, 8 walks, 3 stolen bases (2nd), 2 GIDP, 6 strikeouts (5 swinging, 1 looking), and 5 first at bat hits while leaving 20 men on base in 63 plate appearances and 55 at bats. his OBP was .429 and his SLG was .436, giving him an .865 OPS. defensively, Michael played 125.0 innings in left field, completing all 14 games, and he recorded 26 putouts and acquired 1 assist. Michael currently has an active 15-game on-base streak between May 15-31 as well. Michael also has an active 18-game reached base streak, in which he's safely reached base via either a hit, walk, fielder's choice, or error, between May 12-31 (over 20 days). finally, Michael has an active 15-game reached base streak at home, in which he's safely reached base via either a hit, walk, fielder's choice, or error. that streak spans over April 29-30, May 12-17, May 24, and May 26-31.
in May, Michael bat .316 (18-for-57) against right-handed pitchers and .257 (9-for-35) against left-handed pitchers. there's a larger than usual gap between these two because Michael didn't perform well against southpaws this month. i'm hoping he'll be able to hit lefties more frequently soon. Michael bat .327 (17-for-52) with 4 RBI in all 13 games at home. he hit safely in 11 of the 13 home games he played in and safely got on base in all 13 of them. he was hitless in 2 home games, but still reached base in both. Michael bat .250 (10-for-40) with 1 RBI in 11 of 14 games away from Progressive Field. he hit safely in 8 of the 11 road games he played in and safely reached base in 9 of them. he was hitless in 3 road games, but still reached base in 1. Michael hit .136 (3-for-22) with runners in scoring position, producing 3 RBI in May. breaking that down, he hit .143 (1-for-7) with RISP and 0 outs, .200 (1-for-5) with RISP and 1 out, and .100 (1-for-10) with RISP and 2 outs. this was bad all the way around, i can't sugarcoat it. with 2 outs in an inning in May, Michael bat .282 (11-for-39). he had 3 doubles, 1 RBI, 7 walks, and 5 strikeouts (4 swinging, 1 looking). this is a respectable improvement for Michael from last month. additionally, he hit .275 (11-for-40) with 5 RBI with runners on base and he did not come to bat at all with the bases loaded this month. Michael also bat .308 (16-for-52) with the bases empty. he had 3 doubles, 5 walks, and 6 strikeouts swinging. vs. the Detroit Tigers, Michael bat .200 (2-for-10) in 3 road games in May. (it was initially supposed to be a 4-game series, but 1 game was postponed due to rain and will be made up in July.) the Indians went 1-2 in the games he played in. overall, Michael had 2 singles, 1 run, 2 walks, 1 first at bat hit, and 2 total bases. he also struck out swinging once and left 5 men on base. furthermore, he had a .333 OBP, .200 SLG, and .533 OPS. defensively, he played 25 innings/3 complete games in left field and recorded 5 putouts. maybe it was the cold weather or the tough lefties on the mound, but Michael was not at his best in this series. vs. the Kansas City Royals, Michael bat .333 (8-for-24) in 6 games--3 on the road and 3 at home in May. the Indians went 3-3 in the games he played in. Michael's 8 hits were all singles, but he also had 2 RBI, 2 runs, 1 walk, 1 stolen base (2nd), 1 first at bat hit, and 8 total bases. besides that, he grounded into 1 double play, struck out swinging 4 times, and left 7 runners on base. furthermore, he had a .360 OBP, .333 SLG, and .693 OPS. as the left fielder, he played 47 innings, but only 5 complete games because he left 1 game early after 3 innings following spraining his right ankle. he totaled 12 putouts as well. i wish he would have acquired a few extra base hits, but his performance against some quality left-handed pitching in this series was exceedingly satisfactory. vs. the Minnesota Twins, Michael bat .333 (4-for-12) in 3 home games in May. the Indians went 1-2 in the games he played in. overall, Michael had 4 singles, 1 walk, 2 first at bat hits, and 4 total bases. additionally, he struck out looking once and stranded 9 runners. furthermore, he had a .385 OBP, .333 SLG, and .718 OPS. he played 26 innings in left field, but only 2 complete games because he was lifted for a pinch runner in the bottom of the 8th inning in 1 game. he also recorded 4 putouts. despite having no extra base hits or RBI in this series, he was exemplary in the first two games when he tallied four of the Tribe's six total hits combined. the Indians did not face the Chicago White Sox in May. in May, Michael played three games against one National League opponent, going 3-for-11 and batting .273 overall. that's decent for him. vs. the Cincinnati Reds at Great American Ball Park (no designated hitter allowed) and Progressive Field, Michael bat .273 (3-for-11) in 2 road games and 1 home game in May. (it was initially supposed to be a home-and-home series with 4 total games, but 1 home game was postponed due to rain and will be made up in July.) the Indians went 1-2 in the games he played in. overall, he had 2 singles, 1 extra base hit--a double, 1 RBI, 2 runs, 3 walks, and 4 total bases. he also struck out swinging twice and left 4 men on base. furthermore, he had a .429 OBP, .364 SLG, and .792 OPS. in the field, Michael played 26 innings/3 complete games in left and recorded 8 putouts. the majority of Michael's May stats do not rank very high around the league, but some did land in the Top 10.
among qualifying left fielders in the American League, Michael ranked tied for 3rd in hits (27); 4th in singles (22) and batting average (.293); tied for 4th in doubles (5) and stolen bases (3); 5th in OBP (.369); tied for 5th in walks (11); 6th in at bats (92); 7th in plate appearances (103); 8th in OPS (.717); 9th in total bases (32); and tied for 10th in games played (24). Michael also ranked 14th out of 14 players in strikeouts (10), meaning he had the least amount of Ks among AL left fielders. among qualifying outfielders in the American League, Michael was 5th in singles. plus, out of 37 players, he was 37th in strikeouts. among qualifying players in the American League, Michael ranked tied for 97th out of 100 players in strikeouts, or tied for the 3rd hardest to strike out. among all qualifying left fielders in the Major Leagues, Michael was tied for 5th in stolen bases; tied for 7th in hits and doubles; tied for 8th in singles and walks; and 10th in batting average. he also ranked 29th of 29 in strikeouts. among all qualifying outfielders in the Major Leagues, Michael ranked 74th out of 74 players in strikeouts. among all qualifying players in the Major Leagues, Michael's strikeouts were tied for 183rd out of 188, making him tied for the 4th hardest player to K.
is bowling a sport? "yes, it is." best concert ever attended? "only attended one concert in my life (me: WHAT?! ), Drake." worst gift ever received? "probably, you know, some towels and wash cloths." teammate with the best taste in music? "Francisco Lindor." favorite show to binge-watch? "uh, Sportscenter? that work?" do you call it soda or pop? "soda." last movie that made you cry? "Hardball." picky eater or try anything? "picky eater." teammate most likely to lose to Slider in a race? "uh, Carlos Santana." what's on your perfect pizza? "all meats." strangest thing Tito eats? "everything." favorite thing to do during a long rain delay? "play cards." Michael acquired his first multi-hit game of the month on May 6 against the Kansas City Royals when he went 2-for-5 at the plate with two singles. his first base hit came with no score in the top of the 3rd inning, 2 outs, and Santana at 1st base. Michael got ahead in the count, 2-1, and then hit a ground ball single into right field off left-handed starter Jason Vargas. his second single occurred in the top of the 8th inning with 1 out and the Indians down, 1-0. Michael faced right-handed reliever Joakim Soria and after a 1-1 count, hit a ground ball that deflected off Soria's foot and into left field. according to Jeffrey Flanagan and Robert Falkoff's co-authored article on indians.com, there was only a 33% chance of that being a hit, per Statcast. he later scored the tying run on Jason Kipnis' RBI single. Michael potentially could have had three hits in this game, but was robbed of one in the top of the 6th inning. he led it off against Vargas with the Tribe down, 1-0, and after a 2-0 count, sent a ground ball up the middle. alas, Royals 2nd baseman Whit Merrifield slid on the grass to field it and then threw Michael out at 1st. this actually marked the third time in the past two games that Merrifield took a hit away from Michael with his stellar defense. after suffering a minor right ankle sprain and missing three games from May 8-10, Michael was cleared to play ball again on May 12. in his return, he finished 2-for-3 versus the Minnesota Twins with two singles and a walk. he got his first hit in his first at bat in the bottom of the 1st inning with 2 outs and the Indians trailing, 1-0. after a 1-1 count from right-hander Ervin Santana, Michael hit a ground ball single up the middle and into center field. SportsTime Ohio's twitter account provided a short video clip of that. Michael reached base again in the bottom of the 5th inning in his third plate appearance. with 2 outs, Yan Gomes at 2nd base, Santana at 1st, and the Tribe still down, 1-0, (Ervin) Santana threw Michael four straight balls to load the bases. then in Michael's fourth plate appearance of the night, the Twins had left-handed reliever Taylor Rogers on the mound. with 1 out and the Indians still losing, 1-0, in the bottom of the 8th inning, Michael hit another ground ball single into center field after a full count. the pitch sequence went: called strike, foul, ball, ball, ball, single. that gave Michael two of the Tribe's three total hits in the game. at the conclusion of the contest (and the Tribe did get shut out, 1-0), Michael finally boasted the highest batting average on the team for the first time this season with his .294 BA compared to Jose Ramirez's .288. Michael got himself another multi-hit game versus the Twins on May 13 when he went 2-for-4. with 2 outs in the bottom of the 1st inning, he hit a ground ball single past the diving 2nd baseman and into right field on a 2-2 count from right-handed pitcher Jose Berrios in his 2017 debut. it was the second straight game where Michael collected a 2-out hit in his first at bat in the bottom of the 1st. SportsTime Ohio again supplied the twitter video. his second hit came in his last at bat in the bottom of the 9th inning with 1 out and the Tribe down, 4-1. the Twins' right-handed closer Brandon Kintzler was on the bump, but Michael hit a line drive single to center field following a 2-2 count. just like in the previous game, Michael owned two of the Tribe's three hits. he advanced to 2nd base on defensive indifference during Kip's at bat, but the Indians could not rally any further and did lose by a score of 4 to 1.
so Michael got screwed by that call, as has happened numerous times in the past. Michael does not strike out looking very often, he has too keen of an eye and is too good of a hitter for that. the proof? prior to this, Michael had not struck out by a called strike 3 since April 13, and it was merely his third strikeout looking out of his 22 total strikeouts to that point in the year. lamentably, Michael couldn't register a hit on May 14 versus the Twins and he ended the day 0-for-5, reaching once on a fielder's choice. he was the only Indians player in the starting lineup besides Encarnacion not to get at least one hit. he had plenty of opportunities to acquire his first RBI(s) of May, but left an unprecedented six men on base and went 0-for-4 when coming to bat with runners in scoring position. it was not a Happy Mother's Day or birthday eve for the then 29-year old. one other positive from the night was he scored the go-ahead run that gave the Tribe a lead they wouldn't relinquish. in the bottom of the 1st inning, with Lindor at 1st base, 1 out, and the Indians down, 1-0, he faced right-handed starter Chris Archer. after a 2-0 count, Archer threw to 1st to keep Lindor close to the bag. his next two pitches to Michael were balls, putting Dr. Smooth at 1st base and moving Lindor up to 2nd. after Santana (in his first game batting cleanup behind Michael) singled home Lindor to tie the game, Encarnacion grounded into a forceout that allowed Michael to score the run that put them on top. 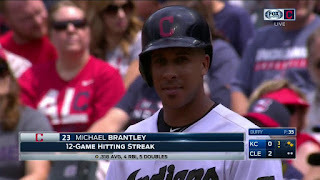 in his 12th game of May, Michael at long last got his first RBI of the month versus the Rays on May 17. it came in the bottom of the 5th inning with Lindor at 1st base, 1 out, and the Tribe losing, 6-2. Michael swung at right-hander Alex Cobb's first pitch and sent a towering fly ball to left-center field for an RBI double. Lindor represented Michael's first run batted in since April 30! in the game against the Houston Astros on May 19, Michael went 1-for-3 with a double, two walks, and one stolen base. his double came in his first at bat in the top of the 1st inning. at the outset, Lindor was at 1st base with 1 out, but before right-handed starter Charlie Morton even threw a pitch to Michael, he threw over to 1st and picked off Lindor. so the inning continued with the bases empty and 2 outs, and after a 2-2 count, Michael hit a line drive double to right field. had Lindor remained on base, Michael most likely would have also gotten an RBI. Michael's first walk occurred in the top of the 7th inning with 1 out and the Tribe up, 4-3. right-hander James Hoyt was now pitching for the 'Stros and Michael fouled the 5th pitch of a 2-2 count before taking ball 3. Michael held off on Hoyt's 7th offering, which was ball 4. then, during Santana's at bat, Michael safely stole 2nd base as Hoyt threw ball 3 to run the count full on Santana. that gave Michael his first stolen base of May and first since April 22! he drew his second walk of the night in the top of the 9th inning. with 2 outs and the Indians leading, 5-3, righty reliever Brad Peacock opposed Michael. following three straight balls and a called strike, ball 4 was thrown. the double and walks were nice, sure, but i'd be remiss if i didn't note how Michael came to bat with a runner in scoring position on two separate occasions in this game and could not deliver. he grounded out to the 2nd baseman both times, stranding three total runners. Morton was ahead in the count, 1-2, in the top of the 3rd with Kipnis at 3rd base, Lindor at 1st, 2 outs, and the Tribe down, 1-0, when Michael hit a ground ball to 2nd base to end the top half of the inning. then in the top of the 5th, with Lindor at 2nd base, no outs, and the Tribe winning, 3-2, Michael swung at Morton's first pitch and hit another grounder to 2nd. that put him in an 0-for-13 rut with RISP. Michael went 2-for-4 with two singles on May 20 against the Astros. it was his first multi-hit game in a week. he got his first single in his first AB in the top of the 1st inning with Lindor at 1st base and 1 out. on a 2-2 count from right-hander Mike Fiers, Michael hit a ground ball single into left field. his second single came in the top of the 8th inning with 2 outs and the Tribe up, 2-0. he swung at Hoyt's first pitch and sent a ground ball into center field. (remember: Hoyt couldn't get Michael out the previous night either--he walked him on seven pitches.) soon after, Michael scored an insurance run on Santana's RBI double. before the game versus the Cincinnati Reds on May 24, Terry Francona addressed Michael's continued success this season when prompted in his pregame presser. from Jordan Bastian's blog on bastian.mlblogs.com, the manager expressed, "it's so nice that you just put him in the three hole, put him in left field, and play the game. when you hit it to left, you're out. the ball goes to where it's supposed to. and he gives you a great at-bat whether it's a right-hander or a left-hander. and he's a great kid. it's wonderful having him back, and i think he's having a lot of fun. i think he found that he missed playing a lot. and he worked so damn hard so he could play again, and i think he's enjoying it." in addition, Tito professed his perception of Michael as a positive influence in the clubhouse with a consistent approach on the field. "i don't think Michael has changed at all," he went on in John Alfes' article on scout.com. "i think the normal progression of becoming more of a veteran (has helped), because i don't know that somebody just takes that step. when they do, i've seen guys try to do it and it doesn't necessarily always resonate in there real well. but i think the natural progression of one, the way a guy plays - cause that's first and foremost - and then how you act, how you carry yourself and then how you're able to deliver a message to one of your guys that you really care about. i think Michael has all those qualities and you see him continue to grow as he gains service time. i think it's a good progression for him." Michael finally got his first hit with runners in scoring position for the month in the game versus the Royals on May 26. the feat took place in the bottom of the 3rd inning with Daniel Robertson at 3rd base, Lindor at 1st, 1 out, and the Indians leading, 2-0. after right-hander Ian Kennedy fell behind in the count, 2-0, Michael sent a line drive to right field that hit off the wall. Robertson scored, Lindor advanced to 3rd, and Michael was held to a long single. Tom Hamilton, Tribe radio broadcaster for WTAM 1100, thought that ball was gone when Michael hit it, and Ryan Lewis tweeted that it missed by a few feet with an exit velocity of 107.6 mph and launch angle of 18.
up until this hit, Michael had gone 0-for-17 with three walks in 20 plate appearances with RISP in May. the single also extended his hitting streak to 10 games. as the above photo shows, Michael and Lindor were the only two players in Major League Baseball to have two streaks of 10+ games this season at this time. 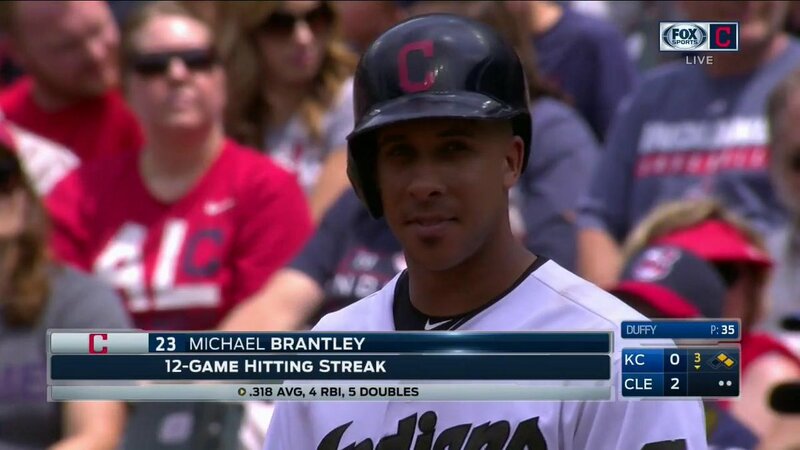 and for Michael, it further marked the 12th time that he's had at least a 10-game hitting streak in his career. in the game on May 28 versus the Royals, Michael tallied his first 3-hit game of the season! it started in the bottom of the 3rd inning, with Roberto Perez at 3rd base, Kipnis at 1st, 2 outs, and the Tribe up, 1-0. left-handed starter Danny Duffy was on the mound and Michael swung at his first pitch, sending a ground ball into left field for an RBI single. Perez scored and Kip moved up to 2nd base. moreover, that base hit gave Michael a 12-game hitting streak! Michael's second hit of the game occurred when he led off the bottom of the 5th inning with the Indians ahead, 3-1. he ran the count full against Duffy, and then hit a ground ball single to 1st base. he probably should have been out, but after Duffy caught the ball from KC 1st baseman Eric Hosmer, he never stepped on the bag, and Michael was credited with an infield single. we'll take it! then during Santana's at bat, on the 0-1 pitch, Michael stole 2nd base for his 5th steal of the year (which still led the team). he advanced to 3rd base on an 0-2 wild pitch, and then scored on Santana's fly ball single to center field. Michael obtained his third hit in the bottom of the 7th inning with 2 outs and the Tribe on top, 10-1. after an 0-1 count from left-hander Travis Wood, Michael hit a line drive single into center field. to go along with his three hits, Michael also made a fantastic diving catch in the top of the 6th inning. you can read all about that in the succeeding In The Field section of this blog. when Michael got his one and only hit (a single) in his fourth and final AB on May 29 in the game versus the Oakland Athletics, that gave him a 13-game hitting streak. it was the longest hitting streak by an Indians player so far this season AND the longest by an Indian since Michael's 15-game hitting streak from September 11-24, 2014, as Paul Hoynes brought to light in his cleveland.com article. Michael had a nice game on May 30 versus the Athletics. he went 2-for-4 with two singles, an RBI, one stolen base, and one run. his first single came in his first at bat in the bottom of the 1st inning with no score. while facing right-hander Sonny Gray, he hit a 2-out, ground ball single into right field on the first pitch. that quickly extended Michael's hitting streak to 14 games! his second hit occurred in the bottom of the 5th inning with the Indians up, 5-3. when Michael's AB began, Lindor was at 1st base. Michael fouled Gray's first pitch and as he took the next pitch for ball 1, Lindor stole 2nd, putting him in scoring position. Michael fouled the third pitch before hitting a ground ball single to left field that got Lindor home and pushed the Tribe's lead to 6-3.
then while Santana was batting, Michael stole 2nd base (on an 0-1 count), giving him the outright team high of six stolen bases on the year! Santana ended up grounding out, but Michael was able to move up to 3rd base as a result and later score on a wild pitch during Encarnacion's at bat. in May, Michael recorded 43 putouts and 2 assists in 45 total chances to yield a perfect 1.000 fielding percentage for the second straight month. honestly, he had a few other opportunities for assists, but ultimately, they didn't pan out. Michael used to be one of the more revered outfielders around the league (with high assist totals), so i hope he can keep throwing out runners as the season continues. Michael flaunted some nice defense in the game on May 5 against the Kansas City Royals, but may or may not have lost out on an assist. the Indians were down, 2-1, in the bottom of the 6th inning. Jorge Bonifacio was at 1st base with 1 out and Tribe reliever Nick Goody had just been summoned from the bullpen. Alcides Escobar came to the plate and after a 1-0 count, he sent a line drive double to left field. Bonifacio already had a great jump because the Royals put on a hit-and-run. Michael ran over and dove to stop the ball from going all the way to the wall, then got up and quickly fired it in to the cutoff man, shortstop Francisco Lindor. unfortunately, Lindor dropped Michael's relay and Bonifacio scored safely all the way from 1st while Escobar ended up at 2nd base with an RBI double. if Lindor made that throw home, there was a high probability that Bonifacio would have been out at the plate and Michael would have gotten his second assist of the year. from Paul Hoynes' cleveland.com postgame article, Lindor stated, "it was a tough play, but we get paid to make tough plays. 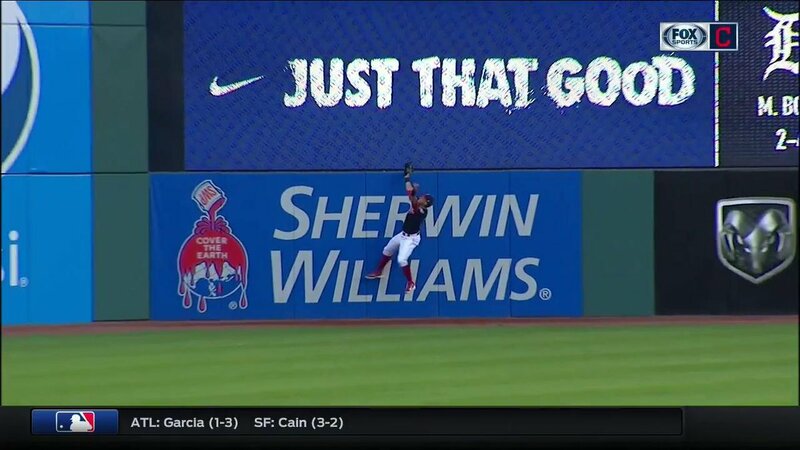 Brantley made a good play. if i catch that ball, i think we get him at the plate. but it was a great call by their third base coach (Mike Jirschele)." "i think we could have had him at the plate, but i messed it up," Lindor additionally admitted in Jeffrey Flanagan and Robert Falkoff's co-authored indians.com article. "i knew Boni was off on the pitch," Jirschele attested. "when it was hit down the line, i knew he had three. then when i saw Brantley slide and come up, and i saw his release point, i knew the throw would be low so i thought i'd take the chance." "he says he's a lot stronger than he was before. i think he's in a pretty good place. for him to dive, there's a pretty good chance that he thinks he can dive if he does. you're not going to try to do something you can't do." Michael made a spectacular catch at the wall in the game on May 26 versus the Royals. the Indians were leading, 1-0, in the top of the 3rd inning with Whit Merrifield at 1st base and Alex Gordon at the plate. the count was even at 2 when Gordon sent Mike Clevinger's fifth pitch to deep left field. Michael went back and jumped at the wall to rob Gordon of a hit. he fired the ball in to Lindor after he caught it, but was unable to double up Merrifield because he safely got back to 1st base before Lindor could attempt to throw to Tribe 1st baseman Carlos Santana. Michael displayed further stellar defense on May 27 in the top of the 6th inning in the game versus the Royals. however, this particular play probably had fans holding their breath. with 1 out and the Indians up, 6-1, Mike Moustakas faced Indians starter Josh Tomlin. Moustakas connected with the 1-1 pitch and hit a fly ball to shallow left field, but Michael ran towards the foul line and made a diving catch. while he was still sliding, he ended up on the warning track, and it's clear from his reaction in the video that his exposed left hand did not appreciate sliding onto the rubber. he probably ended up with a brush burn from that and possibly scratched the hell out of his hand, but at least nothing was broken. "that was a really good catch," Tomlin commended in the article. "i'm probably pretty certain he was playing the lefty to [the] pull side a little bit, so he had to run a long way to get that ball. i hate seeing him dive like that, especially close to the wall for one, and then the [warning track turf] on third base, left-field line, all the way around. that hard stuff. i don't like seeing our outfielders dive on that sort of stuff. but it was a great play, no doubt about it." in the game on May 30 versus the Oakland Athletics, Michael acquired his first outfield assist of the month. the Tribe was trailing, 3-0, in the top of the 4th inning when Adam Rosales came to the plate against Trevor Bauer with Ryon Healy at 2nd base and 2 outs. Rosales swung at Bauer's first offering and lined the ball to Lindor at short, who couldn't make the catch or knock it down, and so it bounced up and into left field. Michael ran in to field it and then fired the ball to catcher Roberto Perez, who easily applied the tag on Healy as he slid towards home plate. that ended the A's rally, as well as the top half of the inning, and it awarded Michael an assist, his first since April 13! "i thought that was a game-changer right there," Perez proclaimed in an indians.com article by both Kosileski and Jane Lee. "that ball was hit really hard and he threw to home plate and we got him, and we got out of the inning. ...it's the first time i've seen him have some carry [on a throw] like that." "that inning turned the whole game by getting out of that," insisted Bauer. "the guy smokes a ball past Frankie, who did the best he could to try to knock it down. and then Brant comes up and makes a really nice throw to get out of the inning." Hoynsie's cleveland.com article the following day included some comments on the play from Michael and Francona. "you can feel when the ball comes out of your hand if you're behind the ball," Michael explained. "sometimes it might sink or cut, but i knew that was a true four-seamer because i got behind the baseball." "they were getting to a point where they're trying to spread that game out," the Indians manager recounted. "not only did they not score, but the inning was over. they would've still been hitting and a runner on second. so, it's a really big play." Michael obtained his second assist in as many days in the game versus the A's on May 31. this one transpired in the top of the 6th inning with 1 out and the Indians down, 3-1. Yonder Alonso was batting and after Clevinger fell behind in the count, 2-0, Alonso sent a fly ball to left that hit high off the wall. Michael caught the ball off the bounce with his bare hand and made a strong throw to 2nd baseman Jason Kipnis. the throw was offline, but Kip was able to dive and apply the tag on Alonso as he attempted to stretch a single into a double. now let's break down the numbers. i am going to document his May #s and the 3rd spot #s, as well as the left field #s, 3rd + left field #s, and overall outfield #s.
Michael played in 24 (of 27) games, 22 complete, in May. he started and played left field in 24 games, completing 22 of those games, appearing in 24 total. he left 1 game early with a sprained right ankle after playing 3 innings. he was lifted for a PR in 1 game in the bottom of the 8th inning because the Indians were winning a blowout. he missed 3 games with a right ankle sprain. Michael bat 3rd in 24 games. Michael played in 22 complete games. May 4: game postponed, to be made up July 1 at 1:10 pm as part of a day-night DH. Game /7 & /31, May 8: still out, getting treatment for right ankle sprain. Game /8 & /32, May 9: still out, getting treatment for right ankle sprain. Game /9 & /33, May 10: still out with right ankle sprain. May 25: game postponed, to be made up July 24 at 7:10 pm. so far in 2017, Michael has 188 plate appearances and 170 at bats in 44 games (374.0 innings). in total, he has 51 hits, 14 extra base hits, 37 singles, 9 doubles, 5 home runs, 22 RBI, 22 runs, 17 walks, 1 intentional walk, 1 hit by pitch, 6 stolen bases (5 - 2nd, 1 - 3rd), 1 caught stealing (2nd), 4 GIDP, 28 strikeouts (24 swinging, 4 looking), 13 first at bat hits, 75 total bases, 66 left on base, 81 putouts, and 3 assists. for more details about Michael's 2017 #s so far, please refer to my Brantley's 2017 #s Through May blog. once again, here's a friendly reminder to KEEP VOTING for Michael and the Tribe to go to the 2017 All Star Game in Miami, Florida, on July 11! click HERE to vote and learn some voting tips and tricks. i have also supplied the current ballot results and updates in the #s Through May blog linked above.